I spent my 2015 Day of Reflection visiting the Museum of Modern Art (MoMA) in NYC. I viewed a piece called “paraSITE homeless shelter” created in 1997 by Michael Rakowitz. The paraSITE inflatable shelter uses excess HVAC air to keep the individual warm. These shelters are simple and cost under five dollars! Why is this supposed to be art or even effective? 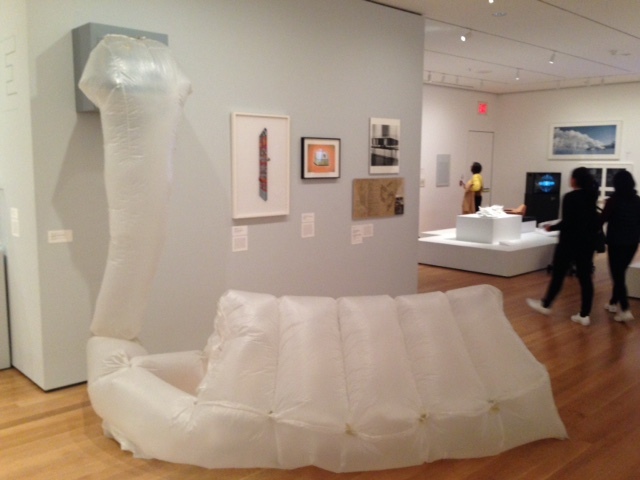 While a student at MIT, Rakowitz thought of using warm air from buildings HVAC systems to inflate and warm a temporary urban shelter for people experiencing street homelessness. Rakowitz witnessed people sleeping on the Boston streets in sub-zero temperatures. The artist was inspired by Bedouin tents that can withstand strong desert winds and cold temperatures at night. Rakowitz designed and built his first structure for a man named Bill Stone in Cambridge. He has since improved his design and substituted the black garbage bags he initially used with reclaimed Ziploc bags. These structures do conform to Boston and New York City code. Over the course of 17 years, Rakowitz has built at least 60 shelters in various cities, many on the east coast. He has created ones with windows, so that the individual can see potential threats while sleeping or sitting. These shelters were never meant to be a permanent solution for shelter; rather, they are intended to create a broader conversation around building and supporting permanent housing options.